 George Alec Effinger, born 1947, has died in New Orleans. A graduate of Clarion, he was the author of numerous novels and stories, including the popular cyberpunk series beginning with When Gravity Fails (1987), Hugo-, Nebula-, and Sturgeon-award winning novelette "Schrödinger's Kitten" (1988), and many satirical works from early short story "All the Last Wars at Once" (1971) to a recent series of stories about Maureen Birnbaum, Barbarian Swordsperson. Known affectionately in the science fiction community as "Piglet" (a nickname he came to dislike), Effinger had been ill for several years. Further details will be posted when they become available. Update 29 April: The SFWA News page links to this Boston Globe obituary of Effinger, and posts a remembrance by Lawrence Person. Update 30 April: The New Orleans Times-Picayune has published this obituary by Susan Larson. Update 2 May: This obituary in Cleveland's The Plain Dealer is compiled from staff and wire reports; Effinger was born in Cleveland, and this piece has some details of his background there. The New York Times today runs this Associated Press obituary of "George Effinger"; it's the same piece that ran in the Boston Globe, but NYT includes a photo. Editorial note: Every obit notes that "Schrödinger's Kitten" won the Nebula in 1988 and the Hugo in 1989, but this is incorrect: the story was published in 1988, and received both awards in 1989. The confusion comes from the different dating conventions of the two awards. § The 2001 Nebula Awards winners were announced Saturday evening, April 27, at a banquet in Kansas City, Missouri. 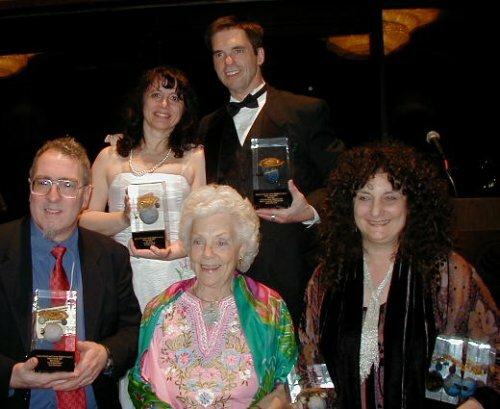 Only Catherine Asaro was present to accept her Nebula; Ellen Datlow accepted for Kelly Link and Severna Park, Tor editor Jim Frenkel accepted for Jack Williamson, and Robin Wayne Bailey accepted for the Crouching Tiger screenwriters. Update 29 April: The Kansas City Star had this coverage and guide to Nebula Weekend by John Mark Eberhart.  Damon Knight rates a death notice on Time Magazine's Milestones page for April 29 (scroll down). Damon Knight, 79, science-fiction author and critic whose darkly wry short story To Serve Man became a famous episode of TV's Twilight Zone; in Eugene, Ore. An early member, with Isaac Asimov, of the influential writers' group the Futurians, Knight, in 1956, wrote In Search of Wonder, considered among the most important works of science-fiction criticism. The title To Serve Man refers to the name of a manual carried by aliens promising to end Earth's war and hunger. The manual turns out to be a cookbook. § Ditmar Award nominations, for achievement in Australian SF, have been announced. Winners will be presented at ConVergence, in June 2002. § All over the weblogs the past day is this item about an Alabama legistator who would finance the space program by taxing.... science fiction. On the Seventh Day. The seven-hour limited series takes place in the year 2850 in an overcrowded world in which the government has assigned people only one day a week to live, while spending the remaining six days in cryogenic suspension. Gary Sherman (First Wave) will executive produce and write the original series, to be distributed through USA Cable Entertainment. "In an overpopulated world of the 35th century, citizens are allowed to live a normal life just one day a week: the other six days are spent in suspended animation." Farmer's agency, Ralph Vicinanza, has issued a notice to USA Network protesting this apparent infringement. (Gary Sherman's website is here.) Ironically, USA Network has another series credited to Farmer, that has been shot and is in editing: Riverworld. Locus Online will post further information as it develops. § The 2002 International Horror Guild Awards were presented last weekend at the World Horror Convention near Chicago, Illinois. In addition to the winners listed below, writer William F. Nolan was presented with the the Living Legend Award, as previously announced. Judges for this year's awards were Edward Bryant, Stefan R. Dziemianowicz, Bill Sheehan, Hank Wagner, and Fiona Webster; awards facilitator was Paula Guran.